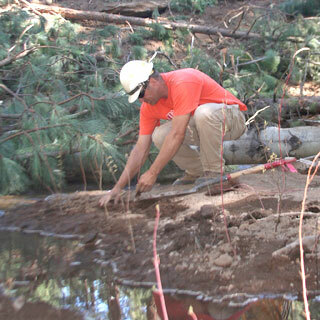 Last Thursday, a Sisters Ranger District road maintenance crew, under the guiding hand of Forest Service Fishery Biologist Nate Dachtler, dug their way into the logging history of Sisters Country as they helped bring Indian Ford Creek alive for redband trout and other aquatic organisms. The crew dug into the old Brooks-Scanlon railroad and logging road bed near Indian Ford Campground on Highway 20 to remove an old culvert put in by Brooks-Scanlon in the 1950s, when the railroad right-of-way was converted for logging trucks that allowed the hauling of logs from Green Ridge through Sisters to the mill in Bend. Two years ago, Dachtler saw a big problem taking place in the creek: The old culvert was blocking the natural migration of the great basin redband trout from getting to the spawning grounds between the Metolius River and Black Butte Meadow. Dachtler and Paul Powers sat down and began planning what had to be done to solve the dilemma. First on the list was to remove the old culvert under the historical Brooks-Scanlon roadbed. That would take machinery and money, so a budget was established, and then they went out searching for the funds. After the project received approval, they went to Trout Unlimited (TU) with their idea. TU jumped in with both feet and went to the outdoor merchant Orvis for a grant to begin the project. And with the assistance of that team and Forest Service dollars, last week the culvert was no more and the trout habitat was on the brink of recovery. While Dachtler and the road crew were digging around the old culvert they exposed the original railroad trestle pilings that supported the bridge across Indian Ford Creek. "I was really impressed with those structures," Nate said. "They must have poured them in place, they're so huge." Looking at the soil being excavated from the old road bed, an observer could also note the huge boulders in the base, hauled there by great work-horses, dragging stone boats and slips. The first priority of the project is to ensure no unnecessary erosion will take place once the culvert removal excavation is done. To keep that from happening, Dachtler is already planting willow, shrubs and aspen that will hold the soil in place and provide cover for the returning fish. While inspecting the new location of the creek, Dachtler discovered an old, overgrown side-channel cut during historical high water times. "I'm going to send the creek into this old side channel again during high water," he said, "as it will be an important element for the trout fry and smaller fish in the future." Before the crew is finished with the project it will be fine-tuned and manicured with a new direction and location for Indian Ford Creek, new plantings that will provide diverse riparian habitat to help keep the creek healthy, and eventually provide the suitable habitat for redband trout to spawn, and, Dachtler hopes, "in time also attract steelhead there to spawn." I think you mean Indian Meadow and Black Butte Meadow. Indian Ford Creek flows into Wychus Creek, not the Metolius. This is great news though! This comment has been hidden due to low approval.